Take a wild and wacky journey into Flumpa's World featuring Wendy Whitten 'The Singing Scientist', Rick Florian and Flumpa the tree frog. Award winning, original music created to get your kid's excited about science - 1st in a series. New Kids' CD Developed by Award-winning Science Educators at Ion Imagination® Entertainment, Inc.
Who's big, green and loves to bop along to tunes that help us learn about science? It's Flumpa! This lovable 6-foot rain forest tree frog and his human cohorts, Wendy Whitten 'The Singing Scientist' and Rick Florian, at Ion Imagination Entertainment, Inc. are taking the nation by storm with a new music release that celebrates the wonder of nature: "Flumpa's World: Frogs, Rain Forests & Other Fun Facts," the follow-up to the award-winning book/tape, "The Adventures of Flumpa and Friends, Someday...Someday." 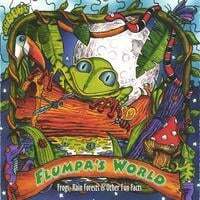 "Flumpa's World" features 12 original tunes in various pop, funk and fun music styles with catchy lyrics designed to help children ages 3 to 9 learn "fantazulmazmic fun facts" about amphibians, reptiles, rain forests and the environment. These lyrics are based on nationally accepted science curricula and are designed to inspire positive action to enhance the sciences and preserve the earth. "A Frog's Life" traces the development of a frog from egg to hopping adult; "Swamp Stompin'" will get kids bopping to real frog, toad and tree frog sounds as they learn about a mucky ecosystem; "Rain Forest Rock" is a danceable tune exploring the different levels of a tropical rain forest; "Rain Forest Paradise" conveys the wonder of discovering the life in a fragile environment; and the haunting drums and background vocals on "Voices of the Forest" echo real recordings made of children and animals in the Amazon region. Kids also love the moving music of "The Future's In Our Hands" and the energy of the closing tune, "Go Flumpa Go!" With its top-notch musicianship, soothing vocals and production values, "Flumpa's World" draws from some of the best talent in Nashville. "Flumpa's World" is the result of a collaboration between Wendy Whitten and Rick Florian at Ion Imagination Entertainment, Inc. of Nashville, who combine science backgrounds with their love for education and performance. Whitten, Flumpa's creator, holds a degree in agriculture and life sciences and has a background in dance and music. Florian is a biologist and teacher who formerly toured with the christian group Whiteheart. The two co-wrote the songs and lend their vocal talents to the recording. "We want to make sense out of science for inquisitive young minds, therefore using a character- such as Flumpa- enables a child to grasp science concepts in a fun and entertaining way." Whitten explains. Flumpa was also a special character that Whitten created as a child to entertain her younger brother. Whitten and Florian are determined to teach children the importance of caring for the world. "We need to lead kids to environmentally friendly habits early on, so that they become part of their everyday lives," says Whitten. But the focus is on fun combined with sound education about animals and their habitats, something applauded by teachers and professionals at schools, zoos and aquaria and parents. Ion Imagination's first release was a colorful book-and-tape set titled "The Adventures of Flumpa® and Friends, Someday...Someday." It received national critical acclaim and awards such as seals of approval from Parents' Choice, The National Parenting Center and Parent Council Ltd., which applauded "this charming story with bright illustrations." Nashville Parent magazine called "The Adventures of Flumpa and Friends" "an absolute masterpiece in children's entertainment." "Here is a wonderfully, innovative and fresh approach to teaching young children awareness of the world around them, biology and natural science. Fun and pleasing music! Children really enjoyed listening to the songs, and seemed to actually learn quite a few facts along the way. Bottom Line: Flumpa's World is a unique music CD/cassette that innovatively combines education and fun. Children learn about their environment and loads of important facts about biology." "This collection of froggy tunes serves up just what it advertises. Whitten's clear-as-a-mountain-stream voice renders the accompanying lyric book all but unnecessary. Fun with a predominantly laid-back, funky musical vibe. Skillful, heartfelt album, one gets the message that it is indeed, Flumpa's World-and we just live in it. "Whitten's clear, crisp voice offers songs written by herself and Rick Florian about reptiles and amphibians, habitats, rain forest ecology and even the life cycle of a frog! Audio quality is excellent, and a lyric sheet is included to encourage participation. Carefully reserached songs teach as they entertain, giving teachers and parents an additional resource for science education."